Happy Cinco De Mayo. I hope you have a fun fiesta planned for today. I know I do. My family loves Cafe Rio. If we’re going out to eat Mexican, it’s the only place my husband wants to go. Cafe Rio claims to be the #1 Mexican Restaurant in the Nation for overall customer satisfaction. Which sort of made me chuckle because Cafe Rio is only in six Western States. But it is Mexican fast food at it’s finest. It is consistently good and we Utahns love our Cafe Rio. Everything is made fresh daily. The tortillas are hand made and you watch them bake them on a circulating stone while you order. They make your order in front of you as you’re herded along the counter with a throng of other hungry people waiting to get their Cafe Rio fix. Do you want your salad with pork, chicken or beef, black or pinto beans, cilantro lime rice, pico de gallo, Cotija cheese, cilantro, sour cream, guacamole, tortilla strips, and Creamy Tomatillo or Cilantro-Lime Vinaigrette Dressing? It’s a huge salad served in aluminum tins. My husband and I always share one and still come home stuffed. I recently made Cafe Rio Sweet Pork Barbacoa Salads for my twin’s birthday party. It’s the perfect way to feed a crowd because everyone can fix it just the way they like it. Frieda from Lovin’ from the Oven recently posted a copycat recipe for the Pork Barbacoa, which she adapted from Favorite Family Recipes. My version below is a combination of both of their versions. Like Frieda, I cut the amount of Coke and brown sugar I used in the recipe and it was still plenty sweet. I’ve also included Favorite Family Recipes copycat versions for the rice, black beans and tomatillo dressing. Put the pork, 1 can of Coke and 1/4 c. brown sugar in a Ziploc bag to marinade. Marinade for a few hours or overnight. Pour meat and marinade into crock pot. Cook for 4 hours on high or 8 on low. Keep lid on to retain liquid. Drain liquid. Shred meat with 2 forks when done. Put shredded pork and Barbacoa Enchilada Sauce in crock pot and cook on low for 2 hours. In a food processor or blender, blend Coke, chilies, enchilada sauce and 1/2 c. brown sugar. Note: The meat and the beans are both very saucy, which is nice if they are being served buffet style because it keeps them really moist, but be sure and use slotted spoons to serve them. Why does the pressure cooker recipe have different ingredients than the slow cooker recipe? I skipped the marinade to make it a fast pressure cooker recipe so I changed the recipe a little bit. I made this today for 10 people. I have to admit I didn’t measure anything, but it turned out FANTASTIC! The entire group ate until they were in a “food coma!” I made the meat in a different location and had it brought to me so I didn’t have time to cook for the additional two hours after shredding and adding the sauce, so I combined the ingredients in a saucepan and simmered for “a long time” poured it over the shredded meat just before serving and turned out perfect still!! Thank you SO MUCH for posting this! We will enjoy this weekly at my house now!! Hi Brandon – thanks for the comment! So glad it was a hit with your group. Nice to know the recipe is so to adapt. Do you know how many these recipes should feed? I’m looking to do a large gathering soon and would like to do this for our meal! Hi Fawn – it’s perfect for a crowd. It will make 6 – 8 servings. I know of two locations in California. One is in Newport Beach and the other is in Lakewood. I’ve had better luck adding additional coke and we just use salsa (1 Cup). The whole thing can be added into the crock pot. We usually cook on low for about 5-6 hours and then shred the pork roast. After that we add the coke, brown sugar to taste and salsa to taste. We then cook it on high in the crock pot for another couple of hours until it tastes right and we do not drain any juices. Hi Brad – Sounds like a delicious option. I’m planning on developing a pressure cooker version soon that cooks up in a fraction of the time. Barbara, do you have a pressure cooker version yet? I want to make this in my IP! Thanks for posting this recipe. The sweet pork quesadillas are my boys’ favorites and I can’t wait to try them at home. On a different note, Cafe Rio really is not Mexican food, more like Tex Mex meets Utah. But it’s still tastes wonderful! I’m sure you’re right Cafe Rio isn’t authentic, but it is delicious! Do you think you could use rootbeer rather than coke? Has anyone tried it? Hi Sue – I don’t know anyone who has tried root beer, but I think with all the other flavors in this recipe you probably wouldn’t notice much difference using root beer instead of coke. I have read your recipe for the Sweet Barbacoa Pork. At the end, it says to combine it with the enchilada sauce and then put all in a crock pot…etc. Am I right in assuming that I would prepare the enchilada sauce ahead of time? Also, when I have had Barbacoa Pork at Cafe Rio restaurants, I never saw (or noticed) green chiles in the meat. Are they there and I just didn’t notice them? Thanks for your question. The green chiles are blended in a blender with the other enchilada sauce ingredients so you would not notice them. If you have all the sauce ingredients at hand it comes together quickly so no need to make it ahead of time. Colleen – I used a small 4 ounce can, but you're right, if you like it spicier, use more. I hope you enjoy it. What size can green chiles did you use in your Barbacoa Enchilada Sauce? Here in Santa Fe, we can get chiles in several different sizes of cans. I suppose it doesn't matter–pick the size can according to your desire for that good old chile kick, right?! Oh, this sounds delicious! I will be making this over the weekend!! This looks fantastic. I have never cooked a savory dish with coke, it should be fun. I ♥ Mexican food. We are lacking in decent mexican restaurants in Sydney. There are more misses than hits thats for sure! this looks so wholesome and delicious! I love Mexican food and I love all the dishes that you presented; that being said, i was wondering if I have a Cafe Rio in my area here in Dallas! Cafe Rio sounds like a fun place! It's not located in MA. 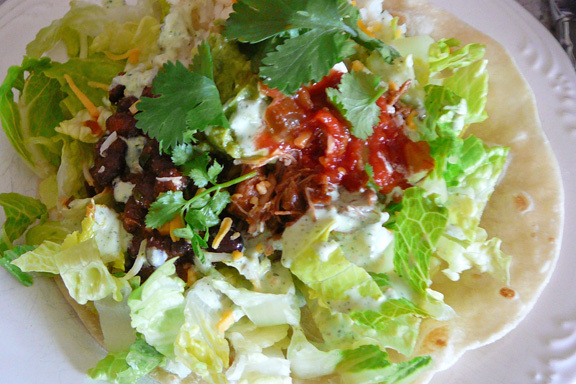 We like pulled pork, so I will be taking out my slow cooker to make your Sweet Barbacoa Pork. Thanks! i've only ever had cafe rio once, but i loved it so much that i grieve the fact that we don't have one in philly! now i can use this and make it myself! This would not last long on my plate. The flavors here sound wonderful and now I am wishing we had a Cafe Rio here in California! Wow Barbara, that looks amazing, what a gorgeous picture!